Gathered from the pages of its newsletters, this is the Bay Head Yacht Club's delightful 125 year history as told in the words of its own members. This compendium of short stories collectively tells the story of the venerable club that has stood proudly at the head of Barnegat Bay since1888. The Bay Head Yacht Club was established in Bay Head, New Jersey on September 8, 1888. Bay Head was then emerging as a popular seaside resort that attracted prominent families from Philadelphia and New York. BHYC members were active participants in early sneakbox and catboat racing on the shallow waters of Barnegat Bay. In 1914, the club was a founding member of the Barnegat Bay Yacht Racing Association. Commodore John V.A. Cattus of Bay Head was elected the BBYRA's first commodore. That summer, O.G. Dale of BHYC won the first BBYRA championship in his 20' Sneakbox Arran. Since then, BHYC sailors have won 190 championships in classes ranging from E Scows to Barnegat Bay's splendid wooden A Cats. BHYC has had many accomplished sailors in history, including Slade Dale, winner of the Cruising Club of America's Blue Water Medal for 1929 for a voyage to Cuba and back in Postscript, a 23' cutter designed by Dale himself. Also included is champion E Scow sailor Sam Merrick, who managed the U.S. Olympic Sailing Team to its best showing ever: an extraordinary three gold and two silver medals in 1984. Merrick was honored later that year with US Sailing's most prestigious award, The National Herreschoff Trophy. Today, the Bay Head Yacht Club has a vibrant membership of 775 families that enjoy active sailing and tennis programs. The Club is proud to continue its leadership in the sport of sailing and to provide a welcome location for generations of families to relax in the friendly town of Bay Head. Recently challenged by the flooding of their clubhouse during Hurricane Sandy and the need to replace the building's wooden piling foundation, BHYC's members have rallied to the cause and demonstrated their love of this great club. The Bay Head Yacht Club's rich history and traditions are alive and well as the Club sets sail for its next 125 years. 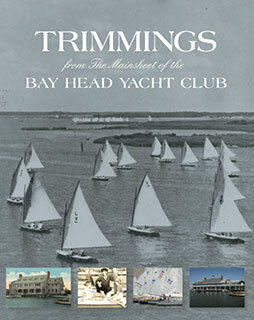 This book is not for sale to the general public it was made exclusively for the Bay Head Yacht Club.